After a month long break our offices came to life again this week with the return of all of our amazing participants. As things are turning green around the Gallatin Valley we are gearing up for another fun-filled summer at BYEP. This summer all of our participants moving into 9th grade will be focusing on the theme of "Healthy Decision Making" as they prepare to enter into their first year of high school. We are excited to help them get ready for that transition and spend as much time outside as possible. All of the BYEPers in the summer before 10th grade will be turning their attention inward by learning about "Mindfulness and Wellness" as a session topic. Having just wrapped up their freshman year of high school we hope to lay the ground work for a successful journey to graduation. Approach Program Managers Ellie and Brian have been hard at work over the last month spending time in Atlanta, GA at the American Counseling Association Conference building their skills and ideas to continue to help BYEP improve and become more effective in supporting each of these extraordinary teens. They are extremely excited to put it to use over the next several months. And of course, we have an incredible line-up of adventures this summer. Soon to come will be pictures of rafting, rock climbing, boat tours to Gates of the Mountains, zip lining, high ropes courses, and more. Stay tuned for weekly updates! 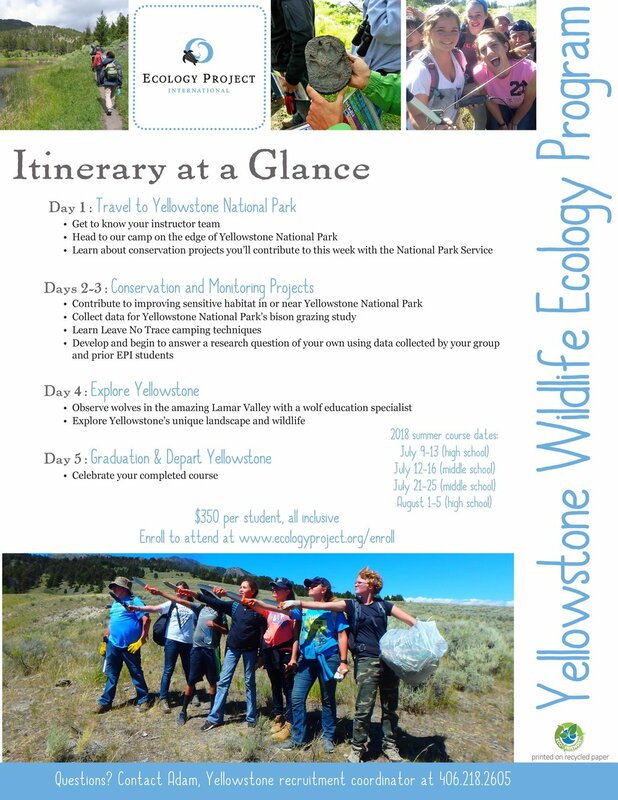 The Ecology Project International out of Missoula has reached out with hopes of including a few BYEP participants in part of a 5 day camping adventure that focuses on the natural environment, conservation, and adventure! Please see the flyer below for more information, and if your child is interested reach out to your Program Manager.